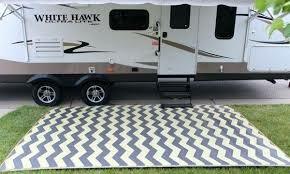 An RV mat is what makes your RV seem more home like and less like a metal moving cage. You should be able to enjoy sitting outside without getting dirty and trailing it back inside. This is exactly what your RV mat is for. This article will showcase all of the best RV mats on the market. Weirdly enough, there are a few things to think about before buying your next patio mat. Most people wouldn’t think this would take some careful consideration. However, it sure does. The following section will discuss the following considerations that you should make before buying your next patio mat. Size is an important aspect. If you move around a lot from campsite to campsite you might benefit from a smaller and more compact rug that you can quickly load and unload without much effort. Larger mats are best suited to when you’re camping in more of a permanent site and you might only move twice per year, they’re larger which means they take some time to load and unload into your RV. 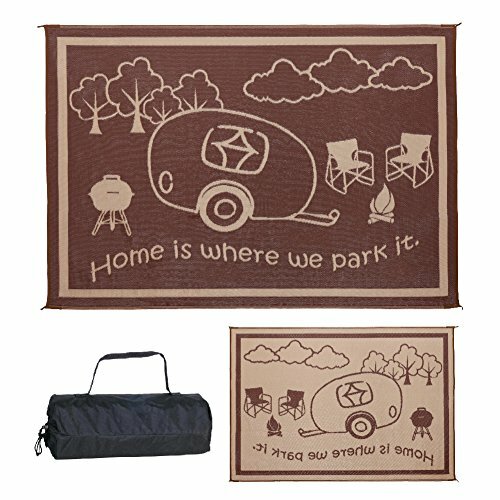 If you’ve got a young family or even just some pets you should invest in an RV mat as this gives them an area where they can roam around without trailing dirt back into the RV. If this is the reason why you need a mat, a larger mat would be best suited to your family as this gives them more space to play around on. Do you have enough space for a large mat? This is something you should be asking yourself before buying one. Most people don’t realize how much space a mat can actually take up in your RV. This also fits into whether you really need a large mat or you could do with a smaller one. This is without a doubt one of the most important sections on this list. In the following section you’ll find a review of each of the best patio mats currently on the market. This should help you find what you’re looking for. 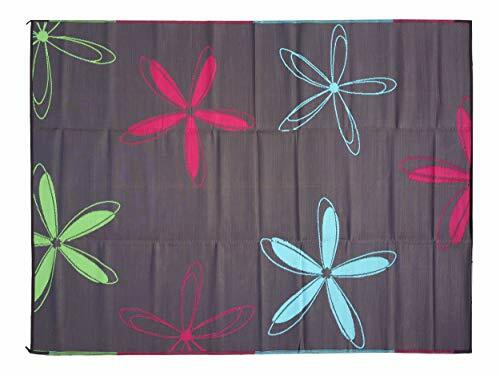 This 9 x 12 floral designed RV mat comes as a brown base with red, blue and green colors spread throughout the mat. The product is made from 100% polypropylene which is a woven plastic that won’t damage grass in the long-run. The UV protected material means that it won’t suffer from fading as well as mildew and mold which are common problems. The material also makes it easy to clean by simply brushing or spraying the mat with a water hose. You also have brown nylon stake loops are each corner if you need to secure it to the ground. This is without a doubt one of the best RV mats on the market as it has all protections like UV protection and is resistant to mildew and mold which are common problems. If you ever do find it dirty, just simply brush it off or hose down with water. The brown nylon stake hoops make it really easy to limit the effects of a window day. The only downside to this product is that the design might not attract everyone, it’s only a mat. However, this design might not suit everyone's style which is why it can be quite limiting. This brown and beige patio mat is an easy to clean product that only ever requires a simple brush or spray with a water hose. The breathable material allows for the grass to survive long periods of time. The product is also protected from the elements like UV protection which could damage your mat by fading or discoloration. The product is also incredibly lightweight and can be stored fairly easily inside a carrying bag which is also included in your purchase. 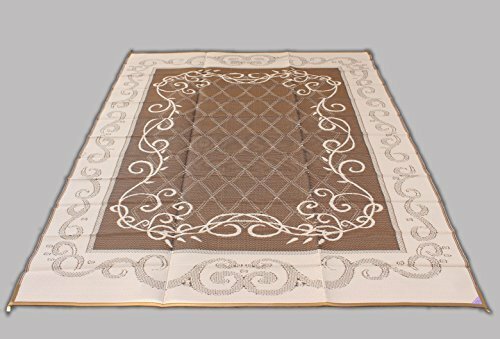 The mat is made from soft and durable virgin polypropylene material which is common amongst RV patio mats. There are many benefits with this products design such as the breathable material that’s used which allows the grass to breath. Some states ban the use of non-breathable materials as this could kill the grass. It also has great protection against the environment like UV rays, mildew and mold. It’s also portable and can be stored within a zipped bag which is also included in your purchase, one of the best benefits is that it’s incredibly soft and will last a long time if looked after properly. The only downsides are that it comes in limited colors and there’s no loopholes at the corners to hold it down during windy days. The soft and durable material is polypropylene which is a woven plastic which is effective in keeping grass underneath your mat alive. Not only does it help the environment, it also protects itself against any elements that might damage it like UV light which could discolor the mat. The product is also easy to clean and will limit the growth of mildew and mold which have always been a problem with RV mats, you simply just sweep off any dirt if it’s not budging just use a water hose that’ll rinse it off. The lightweight design of the mat allows you to simply fold it up and pack it away inside a storage bag that comes with your purchase. This product has many benefits including it’s various sizes that it comes in, this helps anyone that has a large family. 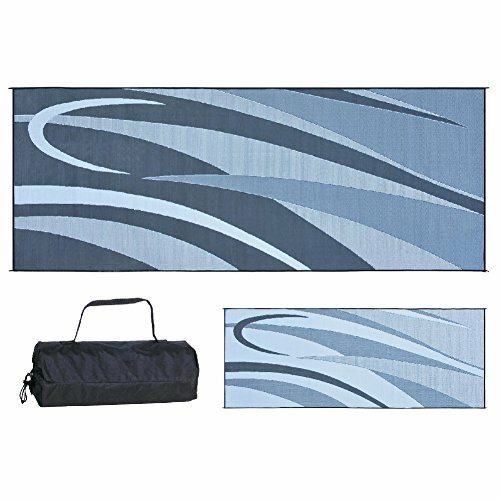 Like all good RV patio mats should do, this mat protects against the elements like UV rays and mold growth, which you can easily hose off with water or scrub with a brush to make sure it’s 100% clean. The breathable material also keeps your grass alive, which is another benefit of polypropylene. The storage bag is an added bonus which you can easily store the compact mat inside. The only downside is that it does get dirty easily and for some reason seems to stick more to this mat than others. This product is made from polypropylene which is a special breathable plastic that keeps the grass healthy while laying on top of it. The eco-friendly mat is also great at protecting itself from mother nature as it limits the damage of UV rays that could potentially discolor or fade the mat over time. Not only that, it limits any growth of mildew or mold on the mat. However, if you don’t see any dirt it can be easily cleaned with a hose or brush down. A carrying bag is also included as an added bonus which you’ll use to store your easily folded and compact patio mat. There are many benefits to using this product, the first being that it’s got great protection against the elements. UV rays are great at damaging your RV as well as your patio mat, this product has quality protection against this and other things such as mildew and mold growth. The breathable material keeps the grass alive which is mandatory in certain states that you have a breathable material as your patio mat. The storage bag is also another simple bonus that often gets overlooked. The only downside with this product is that the nylon loops that are used to hold the mat down aren’t strong enough and often break easily. 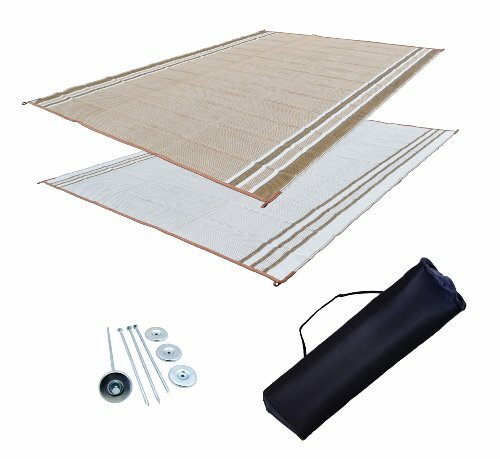 This patio kit comes with pegs and a storage bag as well as the actual mat itself. The breathable material is woven plastic that helps the grass survive while you’ve got your mat covered over it. The material is mildew and mold resistant which is a common feature for many modern day patio mats. Another common feature would also include the UV protection which stops any UV rays from discoloring or fading your mat. 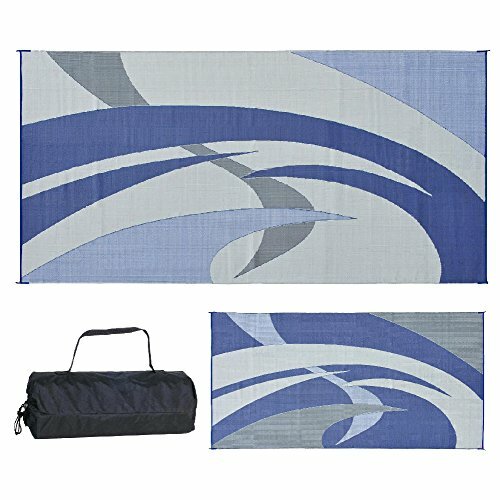 The mat also comes in two sizes with a plethora of different colors and designs to choose from. This mat comes as part of a kit that includes pegs and a storage bag, not many mats come as part of a kit which makes this a great benefit in terms of saving money. The typical protections also exist on this mat including the UV protection, mildew and mold protection also. Another great benefit of buying from this manufacturer is that there are loads of colors and designs that you can choose from meaning you’ll be spoiled for choice. The only downside to this particular mat product is that the peg holes aren’t made of quality material and might degrade quite rapidly and be rendered useless. 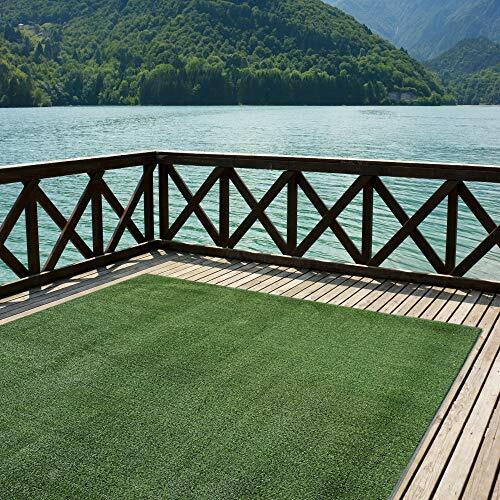 This realistic looking fake grass patio mat makes the front of your RV look completely natural while still having all the benefits of a standard mat like not trailing dirt in through the RV. If you don’t enjoy the look of what looks like just a normal carpet sitting outside your front door, this fake grass mat is exactly for you. The 12 x 8 mat doesn’t just come in the one size but in over 20 different sizes to suit your needs. All of the edges have been bound with binding material which limits and fraying or damage to make the product look unnatural. The best feature is that it’s 100% woven plastic making it breathable for the real grass to flourish underneath and still has the UV and stain protection that all the other mats have. This fake grass product is borderline genius as there will be plenty of people out there that want a more natural look outside their RV but with all the same benefits that a mat offers. This product is truly versatile also as it comes in plenty of sizes that you can choose from to suit your RV. The bounded edges are also something that helps retain the realistic and natural look about the mat, as well as the UV and stain protection. The breathable material allows the grass underneath to survive like normal. The only downside is that the peg straps on this product aren’t the best, this seems to be a recurring problem with patio mats. his product is great for young kids or messy pets. 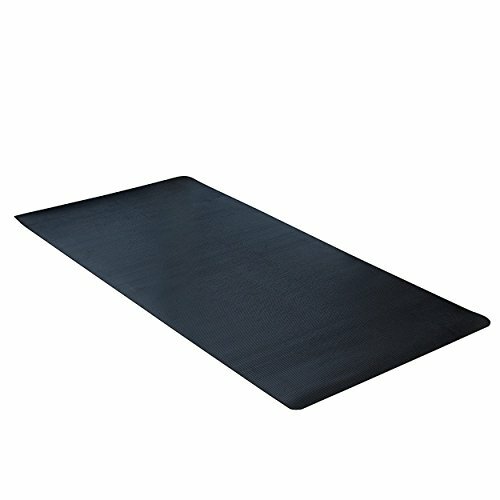 This heavy duty 36 x 6 foot black rubber mat is made from a blend of rubber materials and is super easy to clean by just spraying down with a hose. This product is one of the best on this list and currently the best rubber mat on offer. It’s durable material means that you can use it for all sorts of outdoor activities. The specially designed ridges are the main attraction for many RV owners as it successfully traps any mud, dirt, water and other particles without trailing them into the house, a huge benefit of this mat. Another would be how easy it is to clean, the rubber material means that all of these particles and impurities just run off when hosed down. The only downside is that it’s not a breathable mat which will kill any grass underneath if left for long enough, these types of mat are banned in certain states because of this reason. RThe breathable polypropylene material is just woven plastic that allows air to circulate underneath the mat so that the grass doesn’t die. The mat is coated in a protective chemical that limits the damage from UV rays which can ultimately fade and discolor your RV patio mat. 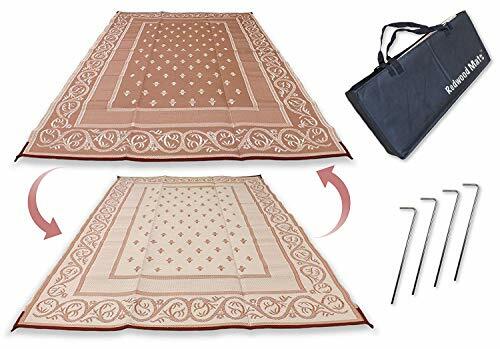 The soft and durable mat will offer you a great option in keeping your RV clean from dirty shoes, any dirt the mat does pick up will be easily washed off using a water hose. The mat is also mold and mildew resistant resulting in dirt and impurities being easily swept away. The full mat can be stored in a simple carrying bag which is included with the purchase. All of the common benefits of your standard patio mat are included amongst this polypropylene patio mat. The woven plastic material being one of those benefits as it allows the grass underneath to breath. The plastic also limits the growth of any mold and any UV rays that could damage the mat through discoloration. For convenience you also get a carry bag that will allow you to safely store your mat away when you’re traveling. 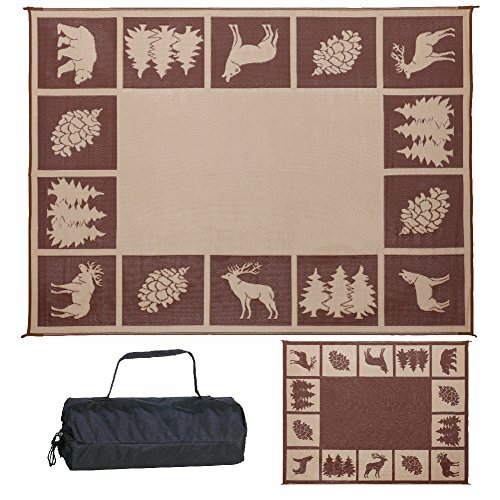 This RV patio mat comes as part of a kit with four ground stakes and a special carry bag that you can use to store your mat. The pegs are great for holding the mat down during those windy days. The mat is made from polypropylene which is a woven plastic that will allow the grass underneath the mat to breath and not die. The textured design will improve traction and limit the chances of anyone slipping when wet. The edges have been smartly trimmed and sealed which will make the edges last longer and won’t wear away as easily. This material won’t absorb water and will actually allow it to flow through which makes it easier to dry. This product has great protection against elements like UV rays that could discolor and fade the mat. As well as, mold and mildew which will could make it smell and ruined. This product is the best 9 x 12 reversible patio mat on the market at the moment. These are the reasons why; they provide you with a kit including the mat, four ground stakes and a storage bag. Not all products come with these added benefits, but, this one does thankfully. The trimmed and sealed edges means that the edges won’t be worn away as fast so it’ll retain it’s quality for longer. The traction on the mat is also great as the water will pass straight through the breathable material making cleaning a lot easier. The standard protections also apply like the UV ray, mildew and mold protection. The only downsides with this is that the mat sometimes struggles to fit back into the storage bag. Also, when using the pegs, they bend easily and eventually might break. The breathable woven plastic material will ensure that the grass won’t be damaged as most sunlight and water will easily flow through the material in order to keep the grass alive. The material is also coated with a special UV protecting that will protect against sun damage and fading. The comfort of this product is also another main feature as it’s 100% durable and soft as it’s made from 100% virgin polypropylene material. Like all good woven plastics, it's incredibly easy to clean by simply just spraying it with water and giving it a wipe with a cloth, the dirt and grime will fall straight off. The product comes with a helpful lightweight and compact storage bag. This really durable material will fight back against mildew, mold and UV rays that will discolor your mat. The strong material will ensure that it looks brand new even years down the line. It product is also breathable which makes it easy for grass underneath to survive for longer periods of time. Because of the material, it’s also really easy to clean as most of the dirt and water just falls off. The only problems with this product are that there aren’t any stakes included with the kit as well as the stake holes being low-grade and can easily tear. There are two different types of patio mat that you can buy. These different types have various pro’s and con’s attached to them. This sand mat was originally used by the military in sandy areas so helicopters could land without blowing sand everywhere. They’re now used as a sand blanket for families at the beach. It will make sure that no sand will be left on the mat when shaken off, it’s mainly for beaches and sandy areas. These mats allow for light, water and air to pass through them and are great for using on the grass as they don’t kill the grass. If the light gets through the grass thanks to more open-weave designs you’ll allow the grass to survive, some campsites ban mats that don’t offer this solution. You’ll be surprised how easy it is to clean most patio mats, it can be done in the matter of minutes and a few hours for the mat to dry out in the warm sun. Follow these steps for the best results. Hang up your mat in between two poles or trees with a piece of rope and begin smacking it with a stick to get any dry dirt off. Once this is complete and you’ve gotten most of it off, you’ll then want to spray it with a water hose and start scrubbing it with a brush or cloth. Once you’ve complete that step, you’ll then want to start the drying process, you can do this by just keeping it hanging in the hot sun throughout the day until its dry. Buying your next patio mat isn’t a hard thing to do, but some considerations must be made before doing it. You need something that suits you and your RV. We hope that we’ve answered any questions that you’ve had on your mind. For any questions that haven’t been answered, this section will do its best to answer all of the most commonly asked questions about RV patio mats. What Are Patio Mats Made Of? Patio mats can be made from a number of materials like nylon, polyester or polypropylene which are all the most common. The material will also be an important factor in whether they’re mold and mildew resistant as well as safe from UV exposure which can fade the mat over time. They’re not always necessary. However, they can be really helpful if you have kids or pets that love playing outdoors as they could trail the dirt back into the RV. They’re also helpful for you to relax and not be worried about what’s crawling underneath you. Don’t have heavy objects like furniture on your patio mats as this could cause holes through constant friction. Sharp objects would also damage your patio mat, this is a bit more obvious however. This all depends on the size of your RV and patio mat. You should be able to roll your mat up and fold it over depending on the thickness. Most mats are quite thin and lightweight so this shouldn’t be a problem. You can buy pegs to put at each corner that will stop your mat from blowing away or even just put some heavy rocks on each side.